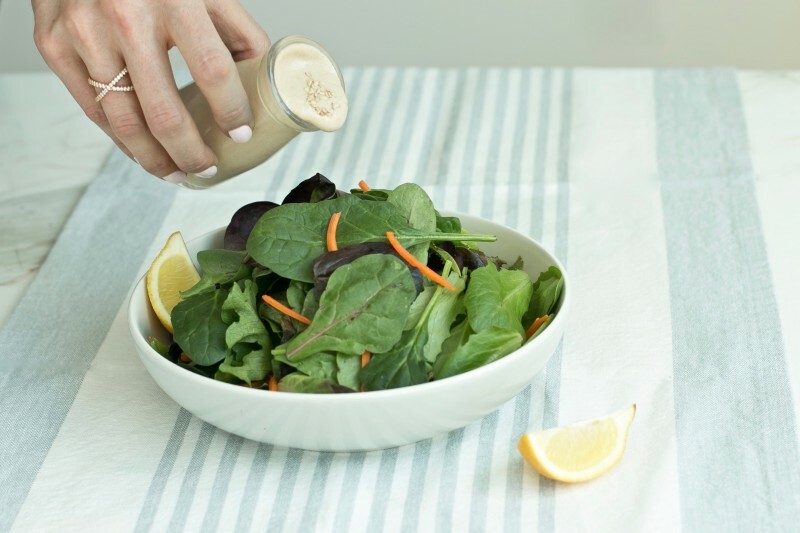 This quick lemon tahini salad dressing is a go-to in my kitchen. I love using seed butters and nut butters for dressings, because they add healthy fat, as well as richness and creaminess to the recipe, with fewer calories and more nutrients compared to the same amount of oil. Tahini is made purely from ground sesame seeds. 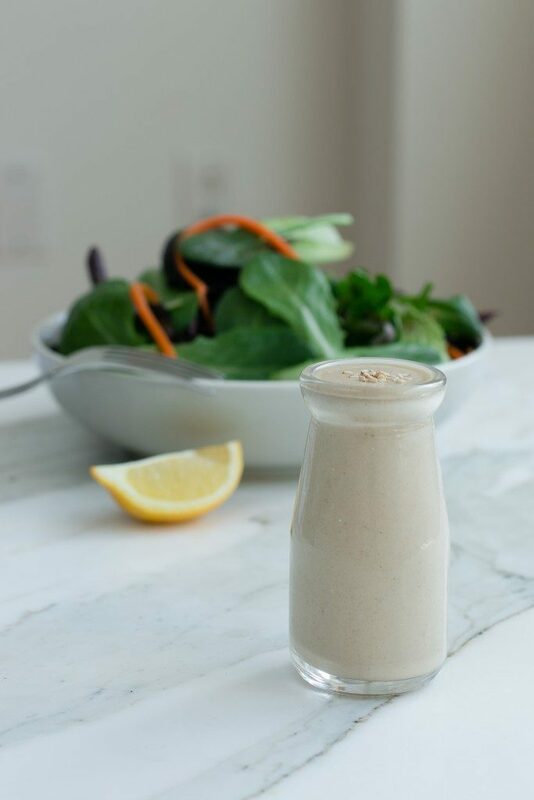 Plant-Based Protein – Tahini provides a little less than 3 grams of protein per tablespoon. Vitamins & Minerals – Tahini provides small amounts of the B-vitamins, particularly thiamin, as well as calcium, iron, copper, magnesium, and other minerals. If you compare one tablespoon of sesame oil to the same amount of tahini, you’ll notice that the oil has none of the minerals and B-vitamins. I always buy my tahini, and other packaged goods for that matter, on Vitacost.com, as it is 25-50% cheaper than health food and grocery store prices, for the same brands! Plus, it’s delivered to my door in 2 days, free of charge. I like this Once Again brand or even the Vitacost brand which is a little cheaper, yet still great quality. I prefer tahini – and other nut/seed butters for that matter – in glass jars like these, because fats/oils readily absorb chemicals from the containers they sit in, so I avoid the ones in tins or plastic. (That’s not to say I never eat out of tins or plastic, I just avoid them as much as I can). In a small bowl, combine the tahini and water. Whisk with a fork for about a minute, until it becomes uniformly smooth and creamy. Then, add lemon juice and salt, and whisk again until thoroughly combined.